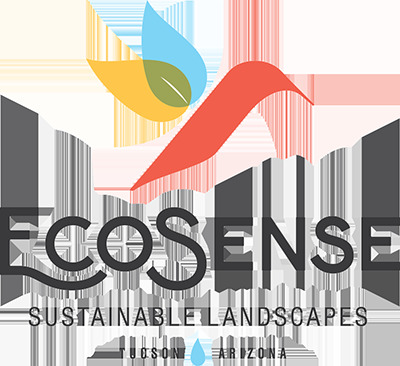 Greywater, outdoor showers, desert gardens, domestic rainwater, water features and other special eco-friendly landscaping projects in Tucson, AZ. BioGravel is our custom solution for your site that integrates nutrients, decomposed granite, and seedbanks to imitate natural desert soil surfaces. The result is a custom ground cover that weathers in to provide a unified visual look while also creating the important subsurface conditions necessary for healthy plant growth and development. One of the most accessible ways to reuse water from your home in the landscape is laundry greywater. A “Laundry-to-Landscape” system utilizes the drain pump from your laundry machine to distribute water to multiple adjustable emitters strategically placed throughout your landscape. For a typical household, it can be possible to grow water-intensive trees like citrus without resorting to irrigating with drinking water. Did you know there is a rebate of half-costs up to $500 for greywater systems? Don’t just bring the shower water out into your garden oasis, bring the whole shower! Our clients love their outdoor showers (what’s more natural than being naked outside? ), and shower water runoff creates an oasis-like microclimate that you can enjoy throughout the year. We offer a range of aesthetic designs and prices, including solar hot water showers. Outdoor Art can be a pleasure to look at, but it can also play an active role in the function of your landscape. Our friend and colleague Greg Corman creates native bee habitats, sculptural perches for birds, and other innovative and handsome art work to complement any landscape. We also enjoy working with local artists to develop unique container plantings and terra-cotta ollas that can be utilized in place of irrigation systems. We select boulders with small, natural depressions that are filled by connecting to a simple irrigation system, mimicking naturally occurring “water pockets” in the desert. The small pulse of water is sufficient to attract birds and lizards but small enough to evaporate quickly, preventing mosquito breeding. It's a perfect focal point to pair with a pollinator garden planted with native plants. Whether your food-production goals include edible native plants in the landscape, kitchen herb gardens, or large-scale gardening and fruit trees, we can help you identify water resources and estimate plant demands to create a “water budget” to develop food production that is entirely supplied by rainwater and greywater and that doesn’t require irrigating with municipal drinking water. Toilets typically comprise about 40 percent of total household water usage, which can make transitioning to a composting toilet a huge water-saver. They are odor-free, require minimal maintenance, and also annually produce about 14 pounds of composted fertilizer that has been tested as safe to use in vegetable gardens—definitely a far cry from the forest service pit toilets of yore. Along with rising water rates, we also face very uncertain supply issues. If you decide to install active rainwater storage for your landscape, we can help you plan the siting, phasing, and construction details of your storage system so that you have the option of providing for indoor water needs in the future. Or—if you are ready to take your home to the next level in terms of sustainability by “going off the water grid”—ask us how!